In its latest issue, Hobby Consola shared some sales data for the video game market in Spain, and more precisely Week 11 to Week 15 2017. It reveals that Yo-kai Watch 2: Bony Spirits / Fleshy sould sold 32 100 units combined, with Bony Spirits outselling Fleshy Souls (16 900 units vs 15 200 units respectively). That’s a pretty strong debut for this sequel, which brings the total for the Yo-kai Watch series to over 166 100 units in Spain (with 134 000 for the first entry)! As for The Legend of Zelda: Breath of the Wild, the Nintendo Switch version sold over 60 000 units as of Week 15 2017. It had sold 46 000 units as of Week 10, which means that 14 000 additional units were sold in 5 weeks. In its latest issue, MCV UK reveals the Top 10 Software for Q1 2017 in the United Kingdom. 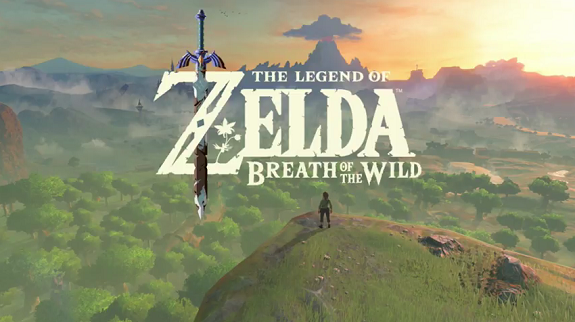 There’s only one game on Nintendo platforms in there: The Legend of Zelda: Breath of the Wild (on Nintendo Switch and Wii U), which was the 7th best-selling game. This is pretty satisfying debut, given the small userbase of the Nintendo Switch (and the Wii U). 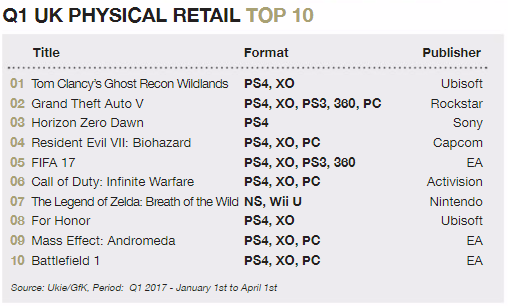 Besides, the chart below is for Q1 2017 (so a total of 3 months), and The Legend of Zelda: Breath of the Wild was launched in March.